Reports out of South Carolina have indicated that when officials approved the spraying of local farmlands with insecticide to prevent the spread of Zika-carrying mosquitos, it accidentally wiped out millions of bees too. The insecticide in question, called Naled, is known to be “highly toxic” to bees, and these vital pollinators appear to be the latest collateral damage in the fight against Zika. In response to the ensuing outcry from local farmers after last Sunday’s bout of aerial spraying in Dorchester County, the local administrator’s office announcedthat the state health department had reported four travel-related cases of Zika virus in the Summerville area of Dorchester County on Friday 26 August. While the health department reported that no one has been infected from a local mosquito bite to date, Dorchester County officials justified the accidental bee cull on the grounds that the mosquito population remained a threat. When you walk into a hotel in the U.S. today, you’ll see many items – chairs, draperies, lamps – that were made in China, Vietnam, Malaysia or elsewhere overseas. But that’s gradually changing, hotel designers and furniture makers tell Hotel Check-In. There’s a small but growing trend among hotels to buy more items from local, regional or U.S. vendors. Hotel owners, developers and designers are increasingly deciding it’s worth it, even if they pay a little extra for a U.S. product. Why? There’s time and risk involved with ordering items from overseas, plus showcasing locally made goods can give the hotel a patriotic or community-minded spin. The Hyatt Regency Minneapolis recently finished a $25 million revamp that used “Made in America” as its central theme. More than three-quarters of the items purchased for the renovation came from the USA, says designer Michael Suomi of New York-based Stonehill & Taylor. The guest bathroom counter tops, for instance, feature granite quarried locally and purchased from a century-old Minnesota company. The Ritz-Carlton Lodge, Reynolds Plantation, in Greensboro, Ga., is in the midst of redecorating to give guests a lighter, more modern look with many U.S.-made products, says Megan Ybarra of the Dallas-based interior design firm Duncan Miller Ullman. The hotel found wall coverings from Kentucky, guestroom carpet from Georgia, and a Texas metalwork firm was hired to custom-make the metal branches that form the base of guestroom ottomans, she says. The InterContinental Chicago’s 477-room renovation emphasizes locally-sourced materials and furniture, says Dan Egan, the hotel’s sales and marketing director. Guest rooms contain drapery from Union, Ill., headboards from Jasper, Ind., wall covering from York, Penn., and room signage in hallways from McCook, Ill.
Montague, a 20-year-old guestroom furniture maker, last April invested in its first-ever factory – and it’s located in North Carolina, says Misty Delbridge, who runs the company’s U.S. division. It made sense, because hotel owners are increasingly seeking products made here and the factory was in danger of closing down, she says. A Hilton hotel in Texas, for instance, is having the company prepare two model rooms for a renovation – one outfitted with furnishings made in Vietnam and the other with furnishings made in the U.S., she says. 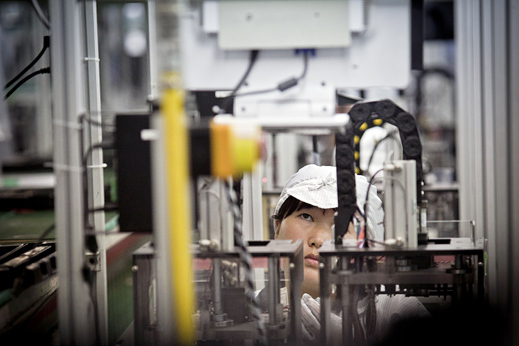 Montague still has about 70% of its products produced in China and Malaysia. Another factor driving the growth in U.S.-sourced products is hotels’ rush to renovate in as small a window as possible so that rooms can stay filled with paying customers, says Delbridge. It’s especially true in New York City, where some hotels can be sold out or almost sold out most nights of the year. Hotel renovations are faster paced than building new hotels from scratch, notes Ybarra, who worked on the Ritz-Carlton Lodge project. It typically takes about 18 months to renovate a hotel, which since the recession has been the most common activity among hoteliers, vs. about three years to build a new one, she says. “Our clients are willing to pay an extra dollar or two to not have the hassle of waiting,” Ybarra says. There’s also the risk of complications, she says, citing long waits at U.S. Customs and a time when pirates took over containers filled with items for a Turks and Caicos hotel. Californians are on course to vote whether genetically modified food must be labeled. A petition was signed by 971,126 Californians, 75 percent more than the minimum needed for a statewide vote concurrent with the Nov. 6 general election. Approval from 50 percent of voters would make the proposal law. “The right to know is as American as apple pie,” said Gary Ruskin, an Oakland-based proponent for the measure, officially known as Proposition 37. The California movement is mobilizing consumer unease over modified ingredients, which are found in about 80 percent of processed foods in the U.S. according to the Grocery Manufacturers Association. The campaign is the best chance for biotech labeling in the U.S. after the failure of similar bills in 19 states and the rejection of a petition to the Food and Drug Administration last month, Ruskin said. Monsanto, a multinational agriculture biotech company, opposes labeling modified ingredients because the move risks “misleading consumers into thinking products are not safe when in fact they are,” Sara E. Miller, a spokeswoman for St. Louis-based Monsanto, said in an e-mail. Biotech labeling, which has been adopted in more than 50 countries, has never been endorsed by the FDA. Modified foods have been in U.S. grocery stores since 1994. Ninety-three percent of Americans say genetically engineered foods should be labeled, according to an October 2010 poll conducted by Thompson Reuters Corp. and National Public Radio. Seventy-nine percent have doubts about the safety of such foods, according to the poll. Should it be approved, Proposition 37 would require labels of foods made with biotech ingredients to state that they were “produced with genetic engineering.” Labels would be phased in over 18 months. Exemptions include restaurant food, alcohol and meat from animals fed with modified grains. The label “would be the equivalent of a skull and crossbones” that would drive away customers and force food producers to stop using engineered ingredients, Joseph Mercola, the initiative’s leading funder with $800,000 in donations, said in a Web posting. Mercola is an osteopath who promotes natural remedies at his clinic in Hoffman Estates, Ill.
Popular New York Times food writer Mark Bittman says Proposition 37 will give consumers the basic right to know what they are eating. GENEVA (Reuters) – In a move that escalates a trade row with the United States, China said it would ask the World Trade Organization (WTO) to adjudicate a dispute over U.S. punitive import duties on 22 Chinese exports, including solar panels and steel products. China first brought the complaint to the WTO in May by asking the United States for formal “consultations” to explain the duties, which Washington says are intended to offset illegal subsidies that gave Chinese goods an unfair price advantage. WTO rules entitle China to demand adjudication after a 60 day period of consultations. China will make the demand for adjudication at a meeting of the WTO’s Dispute Settlement Body on Aug 31, China said in a statement circulated to WTO members this week. The office of the U.S. Trade Representative said in May that China’s decision to bring the dispute to the WTO was “premature and not an appropriate use of dispute settlement system resources”, because the U.S. Department of Commerce was already working to address the issues raised by China. But China’s statement said two subsequent rounds of talks, on June 25 and July 18, had failed to resolve the dispute, which includes wind towers, as well as certain types of steel pipe, wire, cylinders and wheels, aluminum extrusions, wood flooring, magnesia bricks, thermal and coated paper and citric acid. China is by far the world’s biggest producer of steel and is also a leading maker of clean energy equipment such as solar panels and wind towers, helped by Beijing’s ambition of tackling carbon emissions without slowing China’s growth. Foreign competitors complain that its oversupply is the result of a market that is driven by forces such as government edicts and subsidies rather than fundamental supply and demand, and China has created surpluses that distort the global market. China decided to bring the latest WTO complaint, which it says affects exports worth $7.3 billion, after winning a previous WTO dispute last year over U.S. duties on imports of Chinese steel pipes, off-road tires and woven sacks. Many of China’s grievances might have been dealt with by a U.S. court decision last year, which struck down the Commerce Department’s ability to impose anti-subsidy duties on “non-market economies” like China. But the U.S. Congress voted to restore it in March, ensuring U.S. duties on about two dozen Chinese goods stayed in place. The case is one of several currently “live” disputes between the United States and China at the WTO. The Obama administration, still smarting from controversial investments in solar power firms like the now bankrupt Solyndra, has sparked fears of a trade war between the U.S. and China, as the Commerce Department signals it will likely slap a 31 percent tariff on all solar panel imports from China. While some, frustrated by the high U.S. unemployment, want punishment doled out to China, others say protectionism only hurts the consumers who are forced to pay more. Such a tariff has been pushed by companies that manufacture solar panels in the U.S., including Solar World, which has a plant in Hillsboro, Ore. Solar World and others have seen their market share plummet as sales of inexpensive Chinese panels have skyrocketed. The Commerce Department found Chinese companies are guilty of dumping panels on average 31 percent below fair market value. It’s a charge China’s Suntech, the world’s largest solar company, rejects. While still a tiny piece of America’s energy portfolio, the solar industry has seen substantial growth as the price of panels has fallen. The Interstate Renewable Energy Council’s most recent annual report says solar-generating capacity in 2010 quadrupled in the utility sector and went up 60 percent in residential in just one year. But many U.S. solar companies that don’t make panels fear the tariff will drive prices so high, consumers will stop buying. Jigar Shah, president of the Coalition for Affordable Solar Energy, said manufacturing panels account for a mere 3 percent of the 100,000 U.S. jobs tied to the solar industry. “The U.S. now is becoming one of the fastest-growing markets in the world, and this just puts a headwind on that,” Shah said. The Brattle Group did a study for the coalition that predicted a 50 percent tariff would cost the U.S. 14,000 solar industry jobs. Manufacturers would initially see a small increase in employment, but as sales slowed, engineering and installation jobs would suffer.